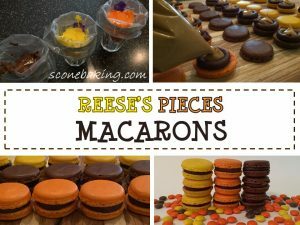 Here is a photo tutorial showing you how to make my yummy, melt-in-your-mouth delicious, Reese’s Pieces Macarons. You get all the flavor and colors of Reese’s Pieces with these macarons. 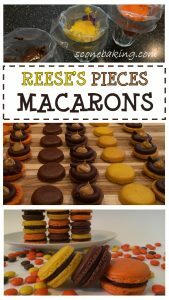 If you love Reese’s Pieces, you’ll love these macarons. 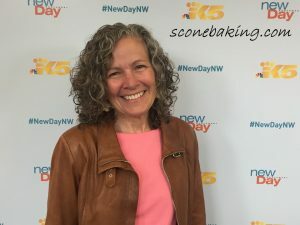 I hope this recipe and photo tutorial inspire you to bake. 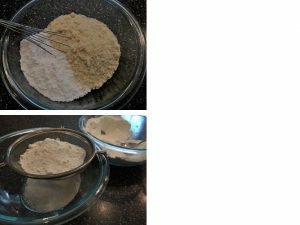 In medium bowl, whisk together powdered sugar and almond flour, sift mixture through a sieve into another medium bowl. Set aside. 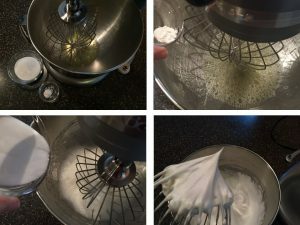 In a stand mixer with a whisk attachment, beat egg whites at medium speed until frothy; add cream of tartar, whip until eggs start leaving a trail; slowly add caster sugar. Continue on high speed until stiff peaks form (when you pull out the whisk the peak should be stiff and not droopy, and you can hold the bowl upside down and nothing comes out.). Pour 1/3 of the powdered sugar- almond flour mixture into the egg whites and gently fold in until incorporated. Continuing to fold in 1/3 of the flour mixture at a time, until just combined. Separate batter evenly in 3 small bowls. Give each bowl of batter a different color using the food coloring gel. Fold until the batter is like hot lava, and you can make a figure eight (do not over mix). 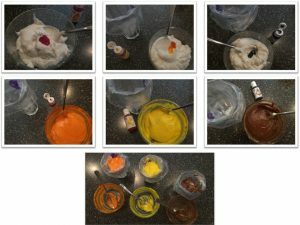 Fit 3 pastry bags with #12 tip, fill each with one of the colored batters, so that you have one orange pastry bag, one yellow pastry bag, and one brown pastry bag. Prepare a template of 1-1/2″ circles about 2-inches apart on your computer, print and tape together (about 20 to a baking sheet 4 across by 5 down). Using the template as a guide under parchment paper on baking sheet, pipe batter onto the parchment paper. The peaks in the center should fall, if they don’t wet your finger and pat the peak down. Tap the bottom of each sheet on the work surface to release trapped air bubbles, use a toothpick to release any air bubbles. Let the macaron shells stand at room temperature for 60 minutes, to dry. Once the macaron shells are dry to the touch, preheat oven to 320º F (160º C). Bake, one cookie sheet at a time, at 320º F (160º C) for 14-17 minutes, until the top does not wiggly separate from the bottom (error on the side of overcooked). Slide parchment with macaron shells onto cooling rack. Cool 10 minutes, remove macaron shells from parchment (they should release, if not, use an offset spatula). Let cool completely. While macaron shells are drying, break up chocolate bar into small pieces into a small bowl. On the stove, in a small pot combine heavy cream and corn syrup, on low heat warm until edges simmer; add to chocolate pieces and let sit for 1 minute. 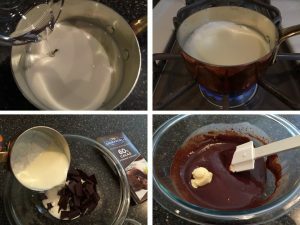 Blend chocolate until creamy. Add butter; blend until smooth. Cover with plastic wrap and set aside (keep at room temperature). 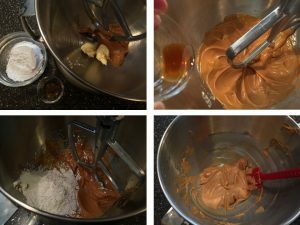 While the macaron shells are cooling, cream together peanut butter and butter in a stand mixer; add vanilla extract, blend until combined. 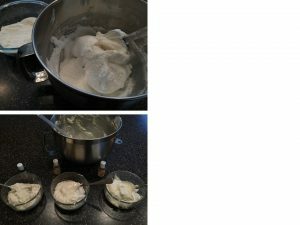 On low speed, add powdered sugar, mixing until completely combined, then increase speed to medium, beating until light and creamy (about 2 minutes). Transfer to quart-size ziplock bag, (or use a piping bag with a #12 tip). Set aside until ready to pipe on macaron shells. When ready to pipe, cut a 1/2-inch hole in the corner. 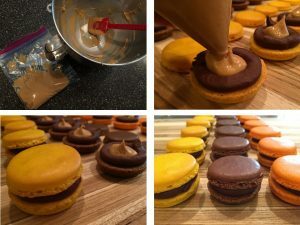 While chocolate is cooling to piping consistency, match up same size macarons, with same color, with one top side up and the other filling side up. 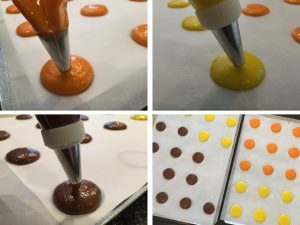 Once chocolate ganache is at piping consistency, fit pastry bag with #12 round tip, fill piping bag with chocolate ganache. Pipe a ring of chocolate ganache around the edges on each filling side up macaron shell. Pipe a dollop of the creamy peanut butter filling in the middle of each chocolate ganache ring. 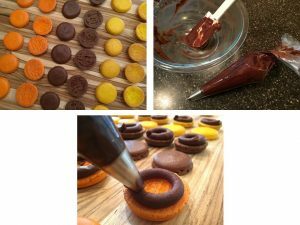 Press 2 macaron shells together until chocolate ganache comes to the edge. Place in the refrigerator, in an airtight container, for about 24 hours (so the shells absorb the flavor of the filling). Take the macarons out of the refrigerator 30 minutes before serving, to bring back to room temp.